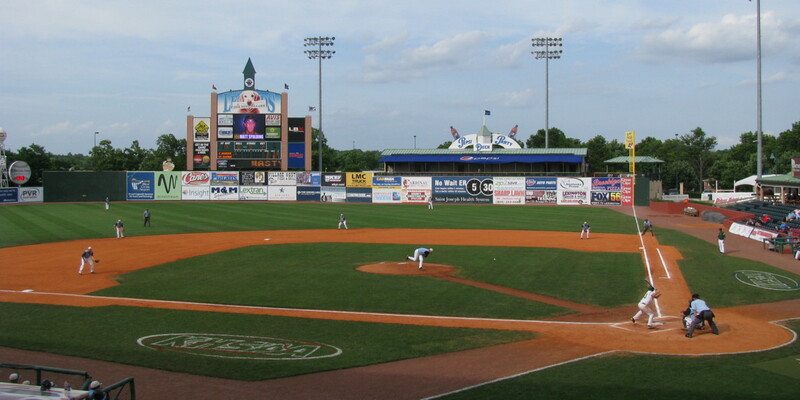 The Kentucky State Baseball Tournament started June 13 in Lexington. 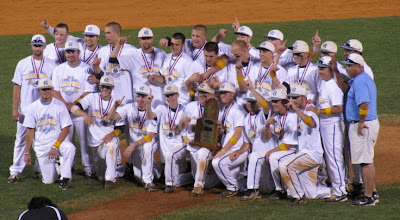 For the second year in a row, our high school was part of the sweet sixteen vying for the title. Led by eight seniors and a whole team of talented, dedicated players, we really felt like this could be our year. Our school had never won a boys' state title in any sport. We were also excited about the team doing so well since three of Blake's friends/former teammates had brothers playing on the team. Plus, since I work at the school, I knew some of the players, too. Kevin had a league game the first night of the tournament, so I stayed home to get him to his game while Tom and Blake went to Lexington to cheer on our Bruins. Blake was even pulled from the stand to be the team's ballboy/batboy. (He loved being in the dugout with the team!) We won! We weren't able to attend the team's second game later that week, but listened to it at home on the internet. Another win for CH! Our boys didn't want to sit with us. 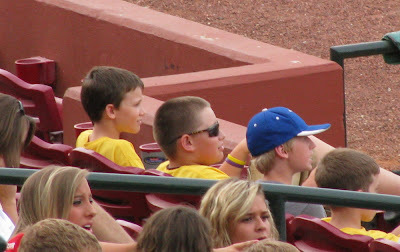 They sat on the front row behind the dugout with their friends. We beat the No. 2 team in the state. Yay! We were going to the finals! 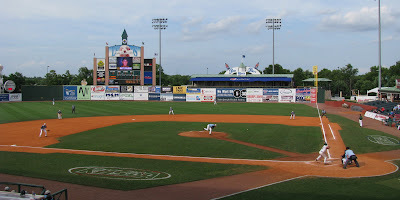 Once again, we headed up to Lexington. (90 minute drive!) CH took off and never looked back. They earned 7 runs in the second inning. Blake's friend Dylan sat with us for a lot of the game. 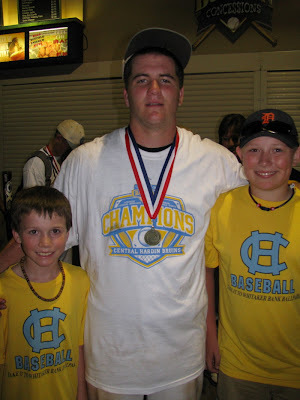 (His brother, Austin, was the pitcher I mentioned earlier. 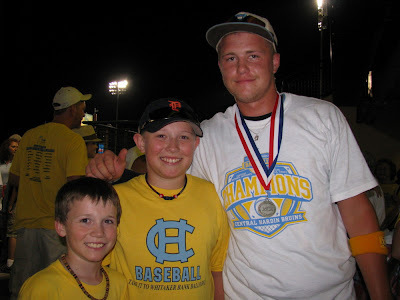 )Blake first played ball with Dylan six years ago and we've all been friends ever since. When we met this family, Austin was the age Blake and Dylan are now. We feel like we've watched Austin grow up and grow into an amazing athlete. He didn't pitch the final game and wasn't in the batting line up either. In the bottom of the 4th inning, we were up 17-1. The game would be run-ruled in the 5th. With two outs, we saw Austin step out of hte dugout with a bat. He was being subbed in. Dylan was with us and we were all hoping the boy at bat wouldn't get an out before Austin had one last at bat. The boy made it to base and Austin was up. 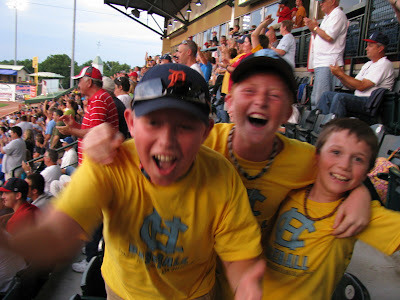 The boys (Blake, Dylan and Kevin) commented that they hoped he'd hit a Grand Slam. Wishful thinking for kids, right? At his last at bat as a high school student in THE championship game, Austin HIT A GRAND SLAM! Amazing. Even more amazing is this shot that I caught of my boys and Dylan celebrating Dylan's brother's success. Our competition earned one more run in the top of the 5th before the game was called. Needless to say, the crowd went wild! 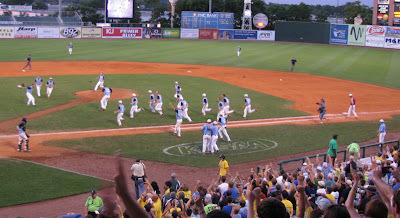 Our boys had earned themselves a state championship. See the yellow arm bands...the team played in honor of Addison Jo Blair. Addison was the three year old daughter of one of teachers. She battled neuroblastoma from just after Christmas until she passed away on May 27. After the game, Austin was named MVP of the State Tournament. Wow! We are so proud of this kid. He's a great role model for our boys. You always hear that if you work hard, you can do anything. Now my boys actually know someone and the goals don't seem out of reach. Another player my boys look up to is the team catcher, Russ. Russ was named to the all-tournament team as well. He was our catcher. Since both of my boys catch, they'd been keeping up with Russ for a couple seasons by watching him at games and reading about him in the paper. This year I had the opportunity to get to know him since he was one of our student workers in the school library. I am so happy for the CH team. They worked hard and earned their championship. I am also happy that our boys had the chance to experience these wins with them. 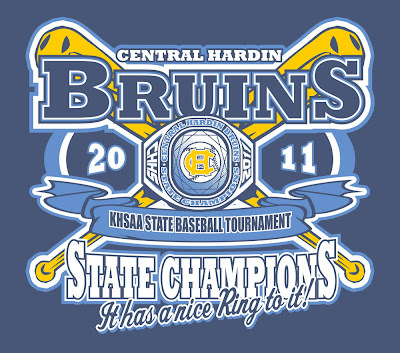 Congratulations, Bruins!!!! Really fun to read through this story. Your excitement shines through. What a fabulous way to end the school year!